Jack Ma, the Founder of Alibaba Group, once said that the next person who can surpass him must be in the big health industry. January 18, 2019 — Jack Ma, the Founder of Alibaba Group, once said that the next person who can surpass him must be in the big health industry. The report of 19th CPC National Congress explicitly raised “implement the strategy of healthy China”, and emphasized “people's health is an important symbol of national prosperity and wealth and power”. So, the encouragement and support of national policies have made collagen industry become one of the most important industries in "healthy China". People's pursuit of health has gone beyond that in any previous eras. With the continuous escalation of people's consumption, the liberalization of China's two children policy and the arrival of an aging society, the consumption demand of the big health industry will usher in an explosive period in a short time. Blue Paper on the Development of China's Big Health Industry (2018) pointed out that at the end of 2016, the added value of China's big health industry was about 7.3 trillion yuan, accounting for 9.8% of GDP, and the employment scale driven by the big health industry was also considerable. The mobile Internet has given rise to a large number of innovative enterprises in the big health industry. Represented by YOROYAL, the social e-commerce enterpriseshave found a new mode, which combines the big health with the new retail, and conforms to the escalating needs and experiences of consumers. Every stage attempt reflects its profound understanding of the big health and new retail. 2019 is the tenth year of YOROYAL. With the help of the mobile Internet, great changes have taken place in the big health industry. 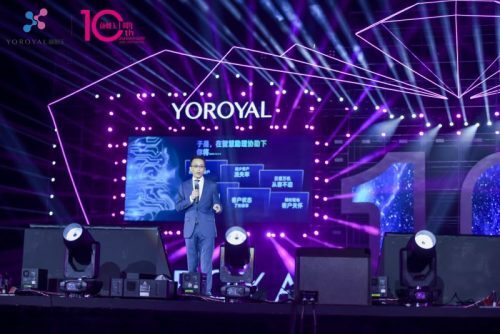 Whereas, YOROYAL spent ten-year hard working on molding a sword, in the long-term development process, it focuses on the research and development of collagen oligopeptide drinks, relying on its long-term strict standards and ingenuity, it brought China's "peptide" to the international level. In addition to scientific and technological innovation, YOROYAL also created good social benefits through peptide technology. By utilizing the characteristics of "peptide" such as easy absorption and immune regulation, it solved the malnutrition of children in remote areas and helped adolescents grow up healthily.